WASHINGTON, D.C. -- The longer that Americans are unemployed, the more likely they are to report signs of poor psychological well-being. 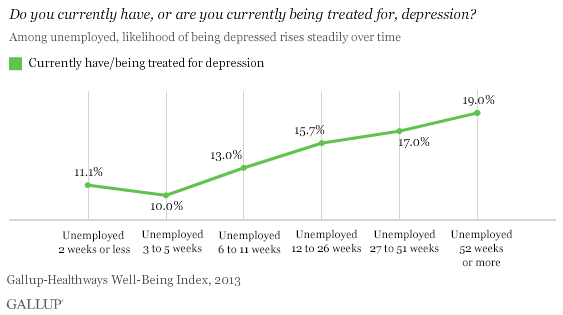 About one in five Americans who have been unemployed for a year or more say they currently have or are being treated for depression -- almost double the rate among those who have been unemployed for five weeks or less. These findings are based on surveys with 356,599 Americans, including 18,322 unemployed adults, conducted in 2013 as part of the Gallup-Healthways Well-Being Index. 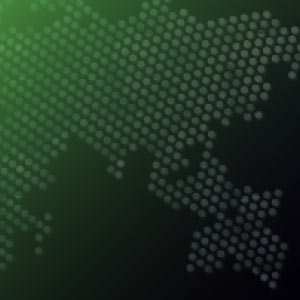 Gallup finds that unemployed Americans are more than twice as likely as those with full-time jobs to say they currently have or are being treated for depression -- 12.4% vs. 5.6%, respectively. However, the depression rate among the long-term unemployed -- which the Bureau of Labor Statistics defines as those who have been seeking work for 27 weeks or more -- jumps to 18.0%. Psychologists have long associated unemployment with a variety of psychological ailments, including depression, anxiety, and low self-esteem. The causal direction of the relationship, though, is not clear from Gallup's data. It is possible that unemployment causes poor health conditions such as depression, or it could be that having such conditions makes it harder to land a job. The loss of hope that can accompany long-term unemployment may be detrimental not only to job seekers' quality of life, but also to their ability to find good jobs. The likelihood of unemployed Americans to agree that they will find a job within the next four weeks falls sharply the longer they are unemployed -- from about seven in 10 among those unemployed for five weeks or less, to fewer than three in 10 among those who have been jobless for a year or more. This marked drop in optimism may affect job seekers' motivation, increasing the risk that they will drop out of the labor force altogether. It's important to note that these results likely reflect not only attitudinal changes among job seekers, but also hard realities facing those who are unemployed for an extended period. A study by economist Rand Ghayad published in 2012 found that employers preferred candidates without any relevant experience -- but who had been jobless for less than six months -- to those with experience who had been seeking work for longer than that. In general, Americans are a happy populace; 82.5% interviewed over the course of 2013 said they smiled or laughed a lot the previous day. Similarly, 81.1% of those unemployed for six months or less found things to smile or laugh about "yesterday." 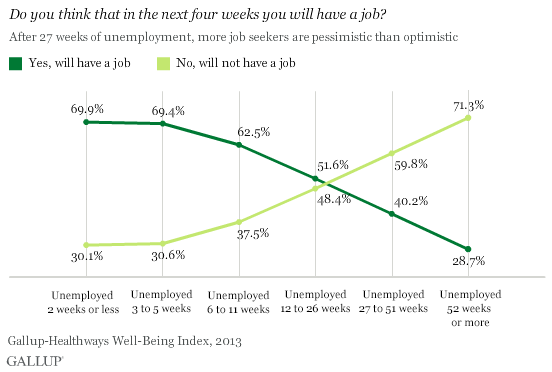 But among the long-term unemployed, this figure drops significantly to 70.7%. The idea that people are less likely to experience positive emotions the longer they are unemployed may come as no surprise -- but that drop may be exacerbated by a growing hesitation to seek social support. A 2011 study of the long-term unemployed published by the Heldrich Center for Workforce Development at Rutgers University found that half of participants experienced shame and embarrassment that led them to isolate themselves from friends and associates. Among the long-term unemployed, 31.1% reported spending two hours or less with family or friends the previous day, versus 21.5% among short-term unemployed adults. 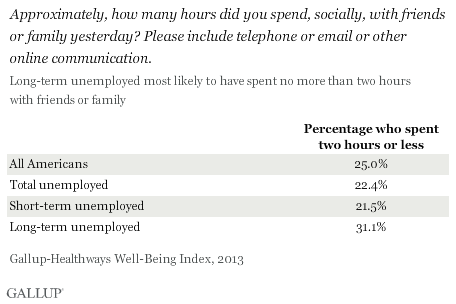 Again, these results don't necessarily imply unemployment itself causes these differences. It may be that unhappy or less positive job seekers are less likely to be able to get jobs in the first place -- if, for example, employers are looking for more upbeat workers. It is also possible that those who spend less time with family and friends are therefore less able to draw on their social networks for employment leads. Record-high rates of long-term unemployment remain one of the most devastating effects of the Great Recession in the U.S. The economic cost is huge -- but just as tragic are signs of poor mental health among unemployed Americans. 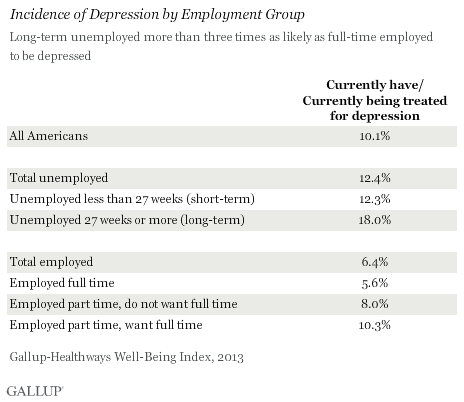 Gallup data shed light on numerous health effects likely to contribute to the long-term unemployment trap. The idea that extended unemployment causes workers' skill to atrophy is a common concern, but the effects of joblessness on candidates' health may be just as damaging to their ability to find -- and, just as importantly, hang on to -- a good job. A recent study by three Princeton economists, including former White House chief economist Alan Krueger, demonstrated that many of those who find work after a long period of joblessness return to the ranks of the unemployed within a year. Previous Gallup research indicates that, in total, U.S. employees who have been diagnosed with depression miss about 68 million more days per year than those who have not, costing employers an estimated $23 billion annually. In the context of a tenuous recovery, employers may be particularly unwilling or unable to retain new employees who regularly miss work. However, closely tracking the health effects associated with long-term unemployment may help policymakers design new interventions to reduce their severity. Programs geared toward helping American job seekers maintain psychological, physical, and social aspects of well-being over the course of their job search may help them to re-enter the workforce ready to be as productive as they were when they left. For results based on the total sample of national adults, the margin of sampling error is less than ±1 percentage point at the 95% confidence level. The total number of unemployed respondents is 18,322, with 13,352 unemployed for less than 27 weeks (short-term) and 4,970 unemployed for 27 weeks or more (long-term). In the U.S., the adult obesity rate is 27.7% so far in 2014, significantly higher than the 25.5% average for 2008.